I grew up in Vero Beach, Florida and took every chance I had to be at the water's edge. I waded along the banks of the Indian River Lagoon, swam in the shore break of the Atlantic Ocean and threw a cast net just to see what I might catch. Even at an early age I embodied a deep passion for salt water. The majority of my childhood memories and life lessons revolve around experiences on the water. Completely entranced with the Indian River Lagoon, I waded its grass flats and mangrove shorelines learning how the ecosystem functions. I never imagined the knowledge I was acquiring would be useful in my career later in life! I spent countless days with friends honing my shallow water fishing skills on the Indian River Lagoon, as well as the occasional venture to the fabled Mosquito Lagoon. We learned the art of poling a skiff in shallow water to intercept tarpon, redfish and snook with either artificial or live bait offerings. After reading in magazines and hearing about the exquisite fishing in the Keys, I knew I needed to pay a visit. On my second visit to the Keys as a child, I realized guiding was a viable profession and knew then it was the life for me! To imagine a person would pay me to take them to catch fish?! Needless to say, the Keys soon became my home away from home. I saved money to fill the truck and boat with gas to get to the Keys as often as possible! Meals were scarce and mostly consisted of PB&J's, but we never cared as the fishing was phenomenal. The vast backcountry of the Everglades and Florida Bay is mighty intimidating, so we learned sections slowly, venturing further away from the boat ramp each trip. When funds were scarce I often drove down with friends to fish the many bridges that connect the bones of coral that are the Keys. 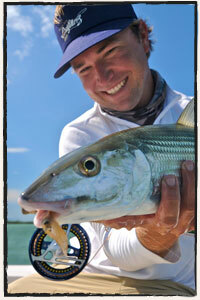 All in all, my efforts paid off greatly- I now call the Florida Keys home and am living my dream as a fishing guide. My free days are spent on the water exploring areas that have potential for holding fish as I never miss an opportunity to be on the water. I rarely try new fly patterns with clients, my free time on the water allows me to inspect how my new creations fish. The fact is, I am addicted to this sport and cannot spend enough time out there! Whether I am poling a bank looking for laid up tarpon, stalking permit in water so shallow their backs are out of the water, staked out on a channel against the mangroves free lining pilchards for snook, or simply by myself catching pinfish the evening before a trip, I'm always stoked to be on the water. I hope I am able to portray my zeal for fishing and the magical settings we fish down here. I look forward to spending a day on the water with you, and also to forming a lasting friendship!